Fantastic performance all around from Leinster. 1-15 were immense. Actually, given the growing injury list, the squad, 1-25 were immense. Leo, Mal, Cian, BOD (BOD, BOD! ), Rocky, Stan, Luke, Felipe…. poor Felipe: I genuinely shed a tear when I saw his face when he had to limp off. A massive player for Leinster, he deserves the biggest accolades we can give him. A real pity to lose him (though a bigger picture positive for Irish rugby to allow us develop an indigenous outhalf). All of them were immense. Isa did incredibly well at fullback, we were seriously worried about that selection – but with Super Rob sick, and Legend Girvan injured, we had no choice. Isa, you did yourself proud. We had lost twice to Munster this season and we really felt we owed them one. People had questioned our pride and passion, but I think we answered our critics. Munster are a team that pride themselves on their physicality and we had to work hard to match them. They are a great team and have been the standard bearers for such a long time. I don’t think anyone doubts Leinster’s passion after this win. I think some elements of the Munster-Leinster rivalry is getting out of hand. I don’t know if that’s because of the new fans being attracted to the game, if it’s because Munster have had such success recently, or what it is. I’ve caught myself thinking some thoughts I’m not very proud of a couple of times after meeting some fans who brought certain views to the table. As far as I know, and please correct me in the comments (linking a source) if I’m wrong, of their last 10 meetings, honours are shared 5 each. In fact, of all matches historically to date (May 6th 2009) I believe that it’s exactly evens. 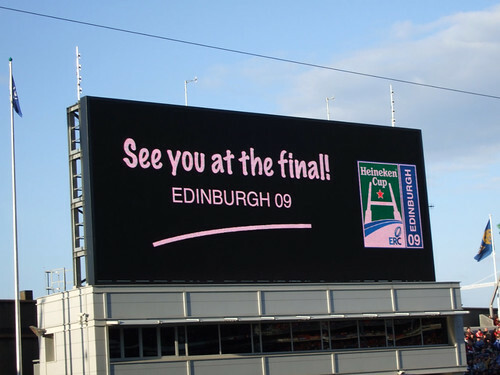 Fans of both teams, and all Irish rugby fans, need to be aware that success can be fleeting. We need to all avoid being bad winners. This Leinster-Munster rivalry is beginning to annoy me. It has gone too far and has Tom Tommed off in the wrong direction. I can’t handle the crowing after beating Leinster. If you want to motivate the opposition, there’s no better way than by poking fun at them, or by belittling their efforts. We are all mixed up in the melting saucepan that is this little country. 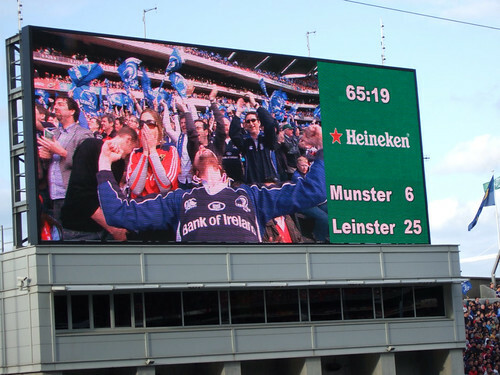 For me it has never been a question of being against Leinster — I’m just for Munster. Those of us who cheered on our Grand Slam heroes in Cardiff didn’t care what province the winners came from; indeed, there was a spontaneous singing tribute in Thomond last Sunday when the Munster fans reprised Tommy Bowe’s greatest hit — ‘The Black Velvet Band’. And that brings us to the last reason for being nice to Leinster — the bookies have it completely wrong and Leinster do have a chance. The All-Ireland semi-final will be some battle. So, let’s go easy on Leinster just in case they flay us with our own words.